This is a course designed for the flowering bulb enthusiast or commercial bulb grower interested in starting their own business for the cut flower market. There are ten lessons in this course with loads of practical skills to get you inspired and to get you growing! You will learn the basics of all good horticultural practice: understanding of soil types, plant nutrition, management of pest and diseases, environmental management and also the various types of bulbs used for flower production. Cut flower growing has experienced rapid expansion in recent decades, resulting in increased demand for training in the skills and knowledge required by this industry in increasingly affluent countries. Successful flower growing can be a complex thing. Not only do you need to know how to grow the flower, but also what to grow and how to treat it after you remove it from the plant.Your knowledge of how to grow, harvest and market a wide variety of different cut flowers will develop throughout this course, and as you learn, you will discover opportunities that you may not have even considered before. A serious course equally valuable to the home enthusiast or the commercial cut flower grower. You learn about growing quality carnations (planting, watering, pest and disease control, fertilizing), different ways of growing them (e.g. as row crops in soil, in hydroponics, in a greenhouse); and harvesting, post-harvest treatments, and quality control. 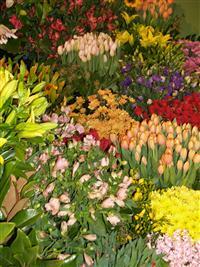 A 600hr course for people working or wishing to work in the area of cut flower production. This course is similar to other VHT002 horticulture certificates in its introductory (core) units, but devotes 50% of the course to topics specifically related to the production and marketing of cut flowers. The Core Units are the same as for the above certificates (i.e. Introduction to Plants, Plant Culture, Soils and Nutrition, Plant Identification and Use, Pests, Diseases and Weeds).